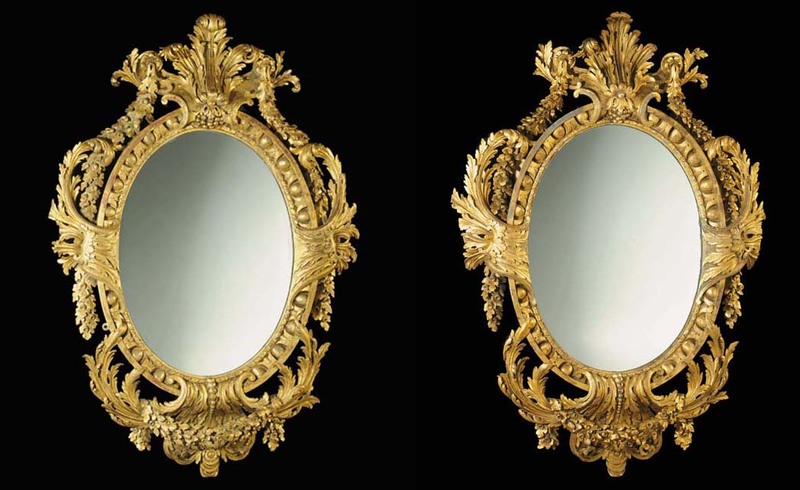 The medallioned mirror-frames are designed in the Roman fashion introduced under Richard Boyle, 3rd Earl of Burlington's encouragement by George II's Board of Works, under the direction of architects William Kent (d. 1748) and his successor John Vardy (d. 1765). Robust cartouches of Roman acanthus are clasped to the centres of the elelgant frames, which are enriched with Ionic echinous-mouldings and wreathed by flowers twisted in ribbon-guilloches. Appropriate for the embellishment of a banqueting-room window-piers or sideboard-tables, garlands of Jupiter's sacred oak issue from the flowered volutes of their antiqued 'pediment' cartouches, which display Bacchic grape clusters; and they also festoon the apron cartouches, which are imbricated with festoons of libation paterae, sacred to Ceres, the kindly harvest deity of Virgil's 'Georgics'. Their acanthus-flourished medallions correspond to the frontispiece of the Roman ornament pattern-book issued by John Vardy and entitled, Some Designs of Mr Inigo Jones and Mr William Kent, 1744. In the 1730s Lord Burlington and William Kent composed picture frames, and other furniture in this fashion, for the embellishment of the Roman Villa, which Burlington had added to his family mansion at Chiswick in the late 1730s. Much of this furniture was executed by the talented sculptor carver John Boson (d. 1743), see M. Jourdain The Work of William Kent, London, 1948, p. 134, fig 73, and J. Cornforth, 'Chiswick House, London' Country Life, p. 36, fig. 12.